The core component of this mod adds portraits to speaking NPCs in the Enhanced Edition Infinity Engine games. It can be installed on multiple platforms including Enhanced Edition Trilogy (EET), Baldur's Gate 1 Enhanced Edition including Siege of Dragonspear, Baldur's Gate 2 Enhanced Edition, and Icewind Dale Enhanced Edition. The mod can add representative portraits for all 4617 speaking creatures throughout these games so that when you speak to them, these NPC characters that inhabit these rich worlds will appear a little bit more alive. the game, it's a good idea to reinstall this mod. Keep in mind that when installing or reinstalling this mod, NPCs on areas you've previously visited won't get portraits, but areas and NPCs you have not yet visited will get portraits. If you start a new game, then all NPCs that should get portraits will get them. This mod has an optional Category Portraits component to assign portraits from a pool of random portraits to actors that are not assigned specific portraits by the main component. This component is highly recommended and covers beings that are genericly named. For example, human characters named "Thief" or "Mugger" will get portraits from the male or female Rogue pool, characters named "Commoner" or "Peasant" will get portraits from the commoners pool, and "Drow" will get portraits from either the male or female Drow pool. There are more than ninety pools of random portraits that range from a few portraits to over 20. There are more breakdowns for groups of Humans than there are for other races. Please note that you may get repetition in portraits if you speak to multiple characters as once a pool of portraits is exhausted, then an additional round of picks from the portrait pool will be assigned to additional NPCs. There are two ways to install the Category Portraits component - Sequentially or Randomly. If you install the component 'Sequentially' then Portraits from the Pool are assigned in numerical order to allow for reproducible results. That means that when you speak to "Mugger" in the dark alley, he should look the same if you were to reinstall the mod. There is also a Random option to grab a random portrait from the pool so that our friend the "Mugger" might get a different portrait if this component was installed a second time. If the random option is selected then a random pick will be selected. The way the random picked works is that all possible numbers from a pool are used before a second pick of the same number is picked meaning that you should not get random picks out of a group of 5 with the same number being used until all 5 of the portraits have been picked. This is optimized for vanilla supported games but you might get some decent results for mod added characters. For example if installed after other mods, then matches from those mods of characters specifically named "Mugger" would get portraits from the Rogue pool. Please note that how other mods name or code their creatures or whether they name their rogue characters specifically "Mugger" or one of the other matching keywords is beyond my control - results may vary. Due to the varying coding standards in mods and the vast number of potential mods available, there is little chance that this component will act perfectly for mod added NPCs but it will do the best that it is able to do. 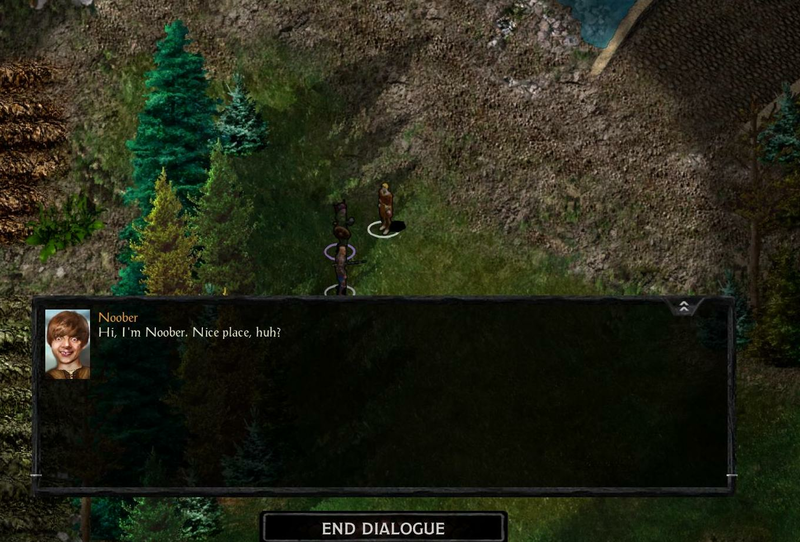 An example of where the component would not act perfectly is a a character for a mod that works for Baldur's Gate 1EE that describes a human as a Half Orc through dialogue. 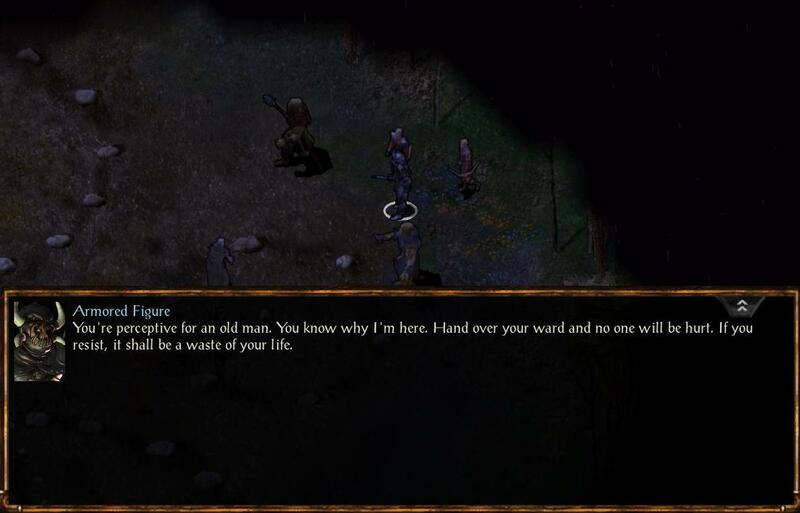 Mods made for Baldur's Gate 1 do not support Half Orcs because there were not a playable race and that character would appear human to the engine and would get a human portrait. A beautiful portrait pack by Isandir in a style similar to vanilla BG1 and BG2 portraits. you've replaced the portrait for Edwin with a custom one, you might not want to load this component. Isandir. If you've replaced your NPC companion portraits with a custom portraits, you might not want to load this component. optional. If you've replaced your NPC companion portraits with a custom portraits, you might not want to load this component. "Vampirized" NPC portraits provided by lefreut. Sources of the pictures include Neverwinter Nights portraits found online, searches for baldur's gate and IWD portraits, and as a last resort search engines were used to round out the collection. If there are any particular portraits that need to be removed you don't wish them to be featured in this work, let me know and the pictures will be removed. If you have any suggestions for submissions or changes, please feel free to comment in the discussion forum. This mod is distributed freely and not for any commercial purpose non-profit. This mod was not developed, supported, or endorsed by BioWare, Interplay/Black Isle, Beamdog or any other official agency. Portraits remain the copyright of their respective rights holders. about it. The purpose of this mod is not to make money but to advances knowledge and progress of the arts through the addition of something new onto a great game. Special thanks to bob_veng on the baldur's gate.com forums for assistance recoloring, adjusting, selecting and creating new portraits for this mod. All pictures are 169x266 or greater. The table in (mod folder)\tbl\bgee.tbl lists the creatures/actors and portrait name. You can reference the creature name to the actor in tools such as NearInfinity. The Portrait names in the tbl are filenames in the portrait folder. Thanks everyone you know who you are, I hope you appreciate the hard work of the artists as I do. Additional thanks to lynx and argent77 from Gibberlings3 Forums for coding assistance. 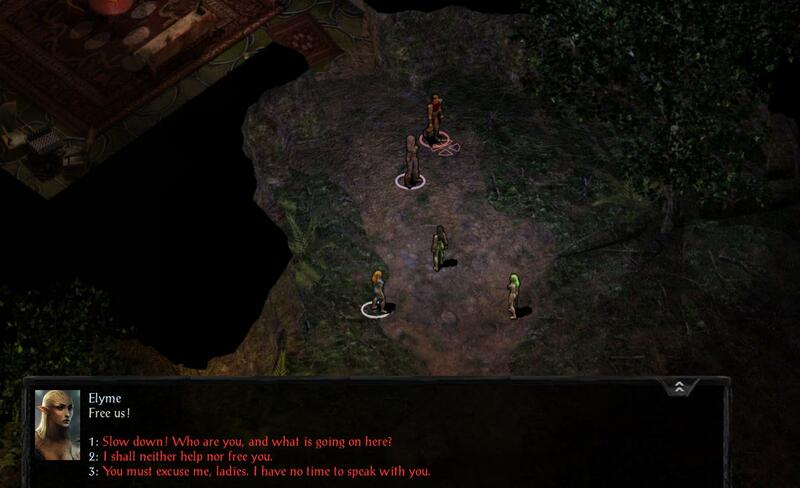 and assistance on the Baldur's Gate Forums. The mod name was suggested by Cahir. Damn, you actually picked the title Gratz for the release! The initial release may have some minor issues, let me know and I'll address them as I'm able to. I've been working on this for a long time. Yeah, I like the name of this mod quite a bit. Good job! Does every NPC receive a portrait? IE, do NPCs that don't fall in any specific category receive a portrait from some kind of default set? That's the eventual goal. I haven't play tested it extensively yet - but going by the output from Weidu it should be 98-100% now depending on the game you are playing (IWD, BG1EE, EET, or BG2EE). Updated to .91 fixing a few things I'd missed in the first release. Huh. So I can get this to work just fine on BG2 but on BG1 it tells me it can't detect the game. Which is...odd. Edit: Oh crap. Looks like my whole game is borked. Rip. I'm gonna have to reinstall all of the mods XD. Edit: reinstalled. Everything installed fine til I tried to install this and then it borked. I don't think it likes BG:EE XD Least not the gog version. You'll need to run modmerge before installing any mods if you own SOD. It's been tested on the Beamdog version of BG1EE/SOD and it's fine. The problems people run commonly with installing mods on SOD are from not running modmerge prior to installing mods. @smeagolheart Modmerge had been ran a long time ago (because otherwise my other mods wouldn't have worked). I've checked this 3 times at this point. Everything is working just fine til I install this on BG1 (and only BG1. BG2 worked just fine) that breaks it (even removing it and trying to uninstall something else will give me the "can't be detected" error and then I can't install anything else because my game fails to be detected thus I have to reinstall. And yes I've tried only installing this mod. Same issue. @Ryz009 Try downloading again, I just updated it, see if it works now. When to install in EET game, right before setup-EET_end? For me, this is a must-have mod ! That's fine. It can be installed after the last mod that add NPCs. On my tests I've been installing it after eet-end. This way everything related to portraits would be in one mod. About Isandir for what it's worth, Isandir explicitly has on his art page that he wants you to ask for his permission before using those portraits. I don't know if he's even around anymore as well to ask, have not seen him in what seems like a couple years. Anyway for those reasons I didn't include drow versions at first. And I had edwina and edwin included but that's already added in bg2tweaks. I could add that and forbid if that is installed by BG2tweaks. There are missing drow portraits in that release right for like Dorn and EE NPCs right? About Isandir for what it's worth, Isandir explicitly has on his art page that he wants you to ask for his permission before using those portraits. I don't know if he's even around anymore as well to ask, have seen him in what seems like a couple years. Anyway for those reasons I didn't include drow versions at first. That's why I've tagged him in my post, so he can see it if he's still around. If no than you can send him an email - available on his site. I only received permission to use portraits for the linked mod. Didn't ask about further redistribution possibilities. Great work. Thank you for the hardwork. I have the old mod ( [MOD] Minor NPC Portraits for BGEE ), and do I just install this on top, or do I need to do anything else ? I'd say uninstall the old one and then install this one. I think they might be able to work together just fine, but might as well go with the newer one. It incorporates most of the old mod plus has new features. 1 - Tried unninstalling the old mod (Minor NPC Portraits for BGEE), and then instal PPE, lost the portraits on my saves. It just shows a blank space. (didnt try on a new area, my bad ). Also, lost customizations on UI.menu (like Space bar continues conversation , lost with the mod Dragospear UI ++). Tried unistall PPE and reinstal the old mod, didnt get the portraits back ( fortunally, I made an entire game folder bkp ). 2 - Restored bkp, installed PPE on top of Minor NPC Portraits, and all seems fine. The customization on UI.menu seems to be kept. 3 - There´s a bounty hunter called Zargas Flintblade on Nashkel Mines without a portrait. I dont know if he is from a mod , though. Again, many thanks for the hard work, hope this feedback helps. Had you visited the area before? If you had, the guy will not show an updated portrait. It's best to start a new game to see everything as intended. You certainly don't have to but then the guy wouldn't have a portrait if you install this after you've visited the area where the guy is. Mod guys should get some kind of portrait from this - if they don't already have one specified - at least people from the 7 playable races. Before starting your next run, you won't have to install minor portraits for BGEE, in fact suggest uninstalling that. Thus mod doesn't effect ui.menu, any issues there would be with weidu reinstallation of the wonderful Dragonspear ui mod. Yep, I was on Gnoll Stronghold when I installed the mod, went back to Nashkell and saw that the portraits were gone. Havent started a new game or tested it on a new area. If I have time in the furure to start a new game, I´ll uninstal the old mod and keep this. Maybe, this will give time to some mods be updated, like Dragonspear UI ++ , EET and BWS with EET enabled (one can only dream). so it's a safe bet to not install the bg1 npc project minor portraits if i want to use this. You can install them, this won't overwrite them. If they are the small portraits for BG1 and not the EE sized ones here then you might not want to install them though. @megamike: You need to install the portraits from the BG1 NPC Project BEFORE installing this mod. The mods overwrite each other's portraits, so it's the last mod that you installed that counts. And there are quite a few NPCs added by the NPC Project that have their own portraits, so you'd miss out on their portraits if you don't install that component. Of course, those NPCs will have low res portraits, but there's little that can be done there without searching for the source of all those portraits, and use higher resolution versions, if they exist to begin with! 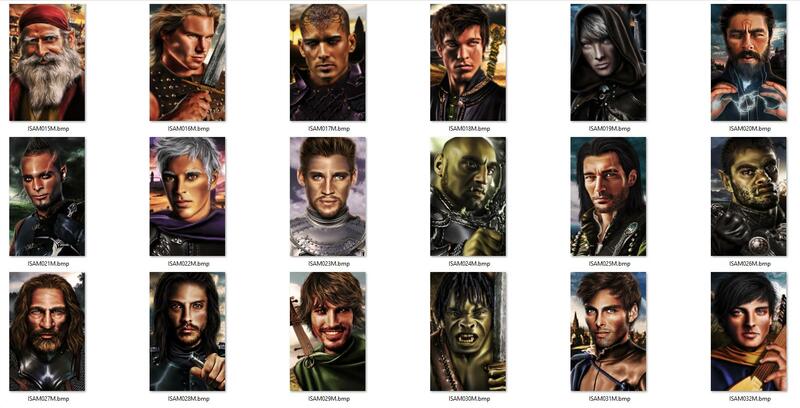 @megamike15 @Thels, @smeagolheart the last github version of BG1 NPC Project has high res portraits for EE. @lefreut: Ohh? Does it actually run properly? @AstroBryGuy kinda recommended against using it. And if so, what's the proper download link? The repository is here. But I only look at the updates, I didn't try to install it. So I don't know if it's a good idea to use it right now. This won't overwrite another mods portraits. If you install bg1npc portraits you will get their portraits - low or high res - and they won't be changed if you install this after. This should fill in the blanks on any missing portraits but won't overwrite any. If it does, let me me know because that is not intended behavior and there's supposed to be a check if the character has a portrait already. EDIT: I checked BG1NPC's code and it appears to destructively overwrite whatever portraits are there. So if you install BG1NPC after my mod or before it, you'll end up with BG1NPCs portraits. This may have somewhat unfortunate consequences. There appears to be 42-43 portraits for only BG1NPC mod added npcs. In those 43 I believe there are 4 overlapping portraits from PPE. 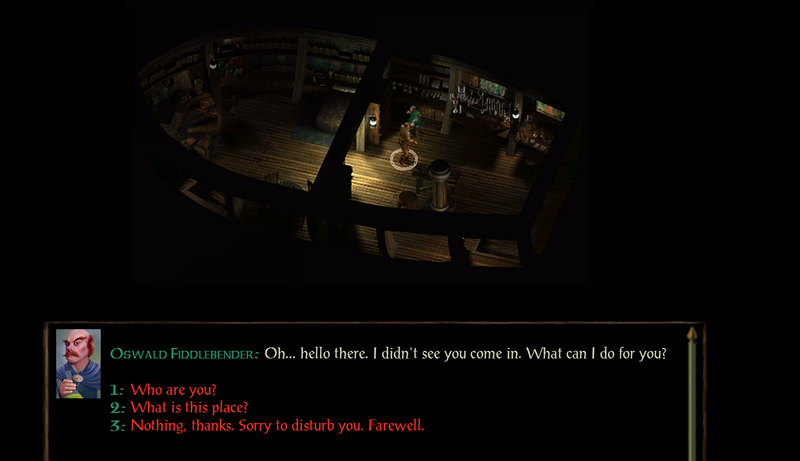 It might be best for me to just incorporate those portraits and say you should skip installing that option on BG1NPC. I'm normally hesitatant to do that because who am I to speculate on how another mod will develop.